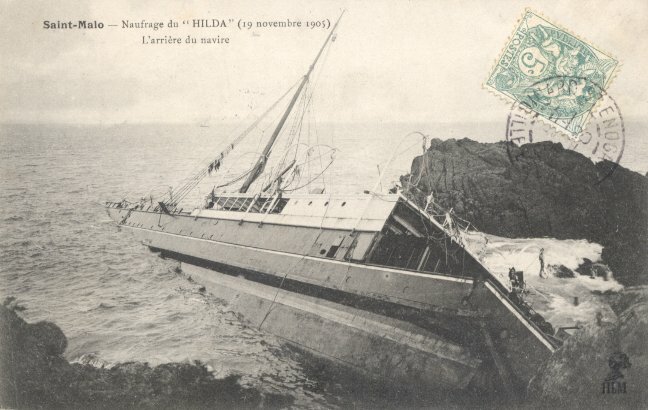 the sinking of the Southwestern Railway's cross-channel steamer Hilda. Lighthouse, three miles from St. Malo. unconfirmed report reached Paris that seventy had been saved. the majority being onion dealers from St. Brieuc and neighborhood. boats were lowered, one of which, containing five men, arrived at St. The top of the Hilda's funnel and her mast are visible at low tide. was a screw steamer of iron construction, and was 235 feet in length. ninety-nine were drowned and only six saved. first-class passengers, including several English people. families or to spend the season at St. Malo and Dinard, (opposite St.
Guernsey; and that the total on board, including the crew, numbered 105.
he had known for thirty years. Jardin light is close to the spot. It cannot yet be explained at what time or how the disaster occurred. here, were rescued by the Ada from the rigging. sailors and passengers went calmly down to their doom. and twelve passengers and a number of the crew were lost with her. captain and nine members of the crew went down. such I am positive that the boilers are intact. over her, carried away the women and children. rescued us when we were nearly dead as the result of cold and exposure. and trying to make the entrance of St. Malo harbor."